In a story you will not find in The Helena World, the Inside Scoop Online has learned that Helena-West Helena Mayor Arnell Willis has hired local Attorney Jimmie L. Wilson to provide legal services for the city. This move comes just weeks after Wilson was fined $1500 and reprimanded by the state's ethics body that polices the conduct of attorneys in Arkansas. It also comes in the wake of a large legal settlement being paid by Willis to Wilson in an earlier case. Wilson's reportedly received at least $20000 in that case. 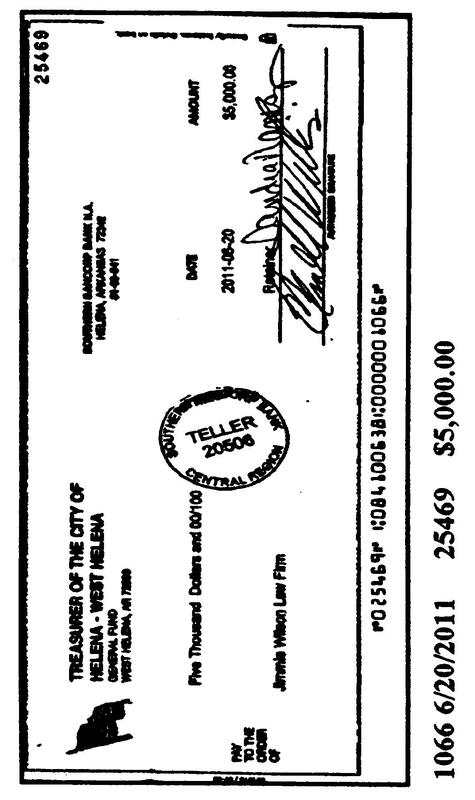 The Inside Scoop Online has obtained a copy of the check to pay Wilson's initial retainer to work on city legal work. Wilson's retainer was $5000. We have unconfirmed reports that Wilson will also receive an hourly fee. These legal fees are being paid over and above the salary being paid to City Attorney Chalk Mitchell to do the city's legal work as well as in addition to the legal advice and counsel provided by the Arkansas Municipal League. Also, there are reports that Wilson's representation might violate ethics rules for attorneys since Wilson also has sued the city in a case where the plaintiff is John Doe.